You already rely on Salesforce for tracking sales leads, manage customer and prospect interactions, and achieve higher levels of performance. Now you can close deals even faster by adding e-signatures to your SFDC instance. 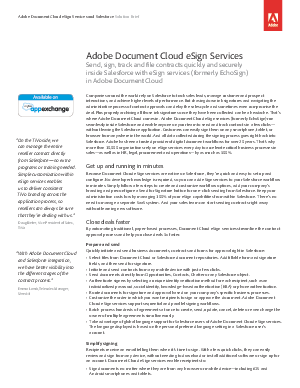 Download the solution brief to learn how Adobe eSign services and Salesforce can help you accelerate your sales processes.